There are so many small organizing projects that you can do quickly. To give you some ideas of quick projects this is a series of posts that will get you more organized and then make it easy to maintain the order. I know! Not the most glamorous organizing project. But wouldn’t it be great to create some extra storage in this space in your kitchen or bathroom. Everyone could use more storage! Let’s look at some ways you can make a difference in 15 minutes. Here are some great options from Pinterest. 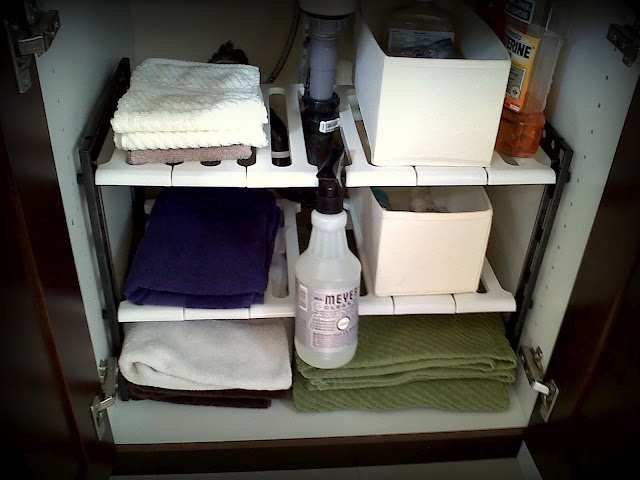 Here is a simple idea from Martha Stewart of a way to store cleaning supplies under your kitchen sink. Use a simple tension rod across the inside of a cabinet to hang spray bottles. It gets them up off the floor which allows you to place small bins on the floor. A simple, cheap and easy solution. Another amazing idea is to add height with shelves. This brilliant product works around the pipes under your sink to add as much storage as possible. See this whole organizing project at Home is Where my Heart is. You can purchase these shelves at Organize-It. This solution allows you to assign separate homes to towels, make-up and hair products (or whatever you store under your sink). Don’t forget the cabinet doors for storage as well. Another cheap and easy idea is to incorporate an over-the-door organizer. 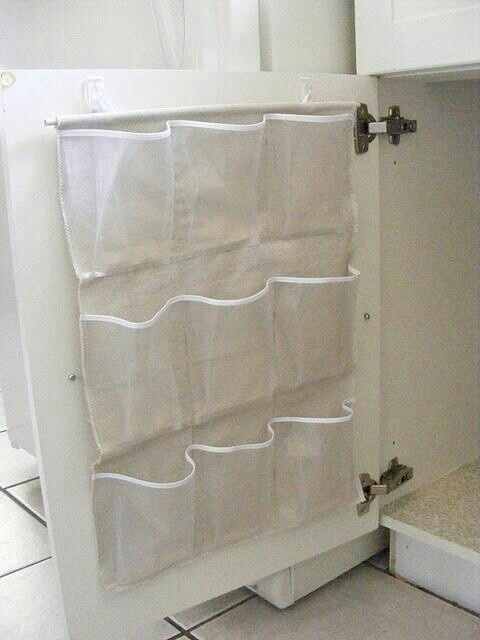 By cutting it to fit your door, you could probably get two or three cabinet doors covered with one organizer. Sorry, I don’t have a source for this, but you can purchase these over-the-door organizers at just about any big box store. I like the clear plastic ones, since they allow you to see what you have without rummaging through each pocket. Use these for often-used items like make-up, hair brushes and hand lotion. Be creative. What works for you will be something that you can maintain organization with ease. This entry was posted in Residential Organizing and tagged Bathroom Organizing, DIY organizing, Kitchen Organizing, Organizing Solutions, Product. Bookmark the permalink.